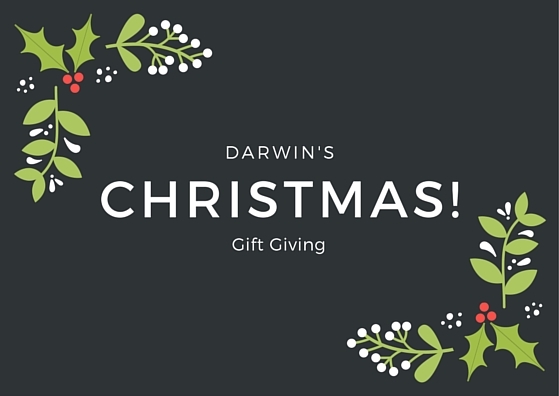 The earliest gift-bringer I read about was Odin, a Pagan Germanic god who is thought to have influenced concepts of Father Christmas in numerous ways, including long white beard and riding through the night sky. Odin wore a blue-hooded cloak and rode through the midwinter sky on an eight-footed horse named Sleipnir, visiting his people with gifts. According to pre-Christian Norse tradition, he entered through chimneys or fire holes on the solstice. In 16th century England (during the reign of Henry VIII), Father Christmas was pictured as a large man in green or scarlet robes lined with fur. He was associated more with good cheer, peace, joy, good food and wine, and revelry. 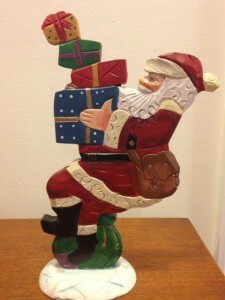 Father Christmas merged with St. Nicholas (Sinterklaas), which morphed into Santa Claus. 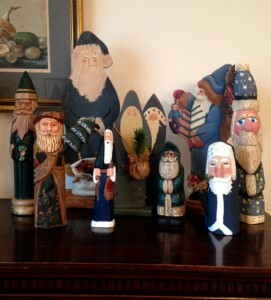 Suffice it to say that most people around the world have a tradition of a Christmas gift-bringer: Santa Claus, St. Nicholas, Father Christmas, Christkind, the Wise Men, an old gift-giving witch called Befana (in Italy). In Scandinavia a jolly elf named Jultomten delivered gifts in a sleigh drawn by goats. And in Russia, an elderly woman named Babouschka (grandmother) leaves gifts by children’s bedsides on January 5th. 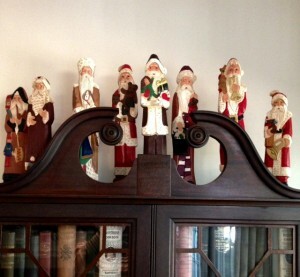 Representations of Santas around the world, L-R: Hungary, 1884; Austria, 1904; Russia, 1903; Canada, 1930; U.S.A., 1935; Mexico, 1923; U.S.A., 1925; Holland, 1920. Presents are left in different places. In much of Europe, presents are left in shoes or boots put out by the children. In Italy, the UK, and the USA presents are left in stockings—and, of course, under the Christmas tree. 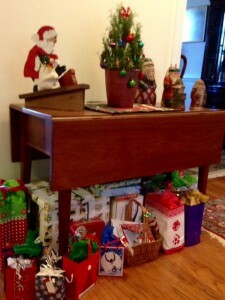 Presents are opened on different days as well. Children in Holland often receive the earliest presents, on December 5th for St. Nicholas’ Eve. On St. Nicholas’ Day (6th of December), children in Belgium, Germany, Czech Republic, and some other European countries open some of their presents. Christmas Day (25th of December) is the most popular gift day for the UK, USA, Japan, and many other countries. The last presents are opened on Epiphany, January 6th, especially in Catholic countries such as Spain and Mexico. 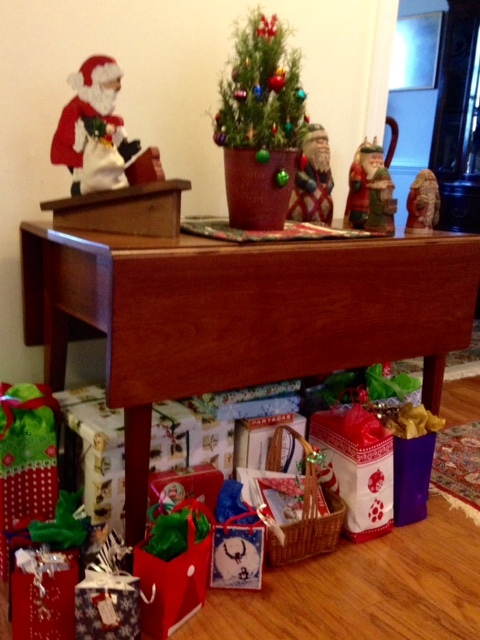 Who gets presents has shifted dramatically over the centuries. Odin gave presents to “his people.” St. Nicholas gave to the poor. According to the Christian Science Monitor, in early modern Europe, gift giving also had roots in Christmas begging, when bands of young men, often rowdy, would wassail from house to house, demanding handouts from the gentry. It wasn’t till the mid-1800s that gift-giving shifted from the poorer classes to children. On the other hand, giving gifts to heads of state, kings and queens, emperors, etc, pre-dates the birth of Jesus. Today, it seems everybody gives gifts to everybody—an impression strongly supported by advertising and merchant specials! Christmas begging from charities is rampant. Salvation Army kettles (which first appeared in 1891) are on sidewalks all over the world. Employers often give actual gift baskets or holiday bonuses. Co-workers, neighbors, and friends exchange gifts. Parents give gifts to children, but people also give gifts to parents, grandparents, aunts, uncles, siblings and step siblings, and second cousins twice removed. By now, all the glittery wrappings are probably torn asunder, the gifts put away, exchanged, maybe saved for re-gifting, and the leavings look more like this. 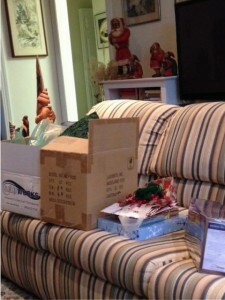 And I’m left wondering, how many Christmas presents are gifts and how many are perceived obligations.